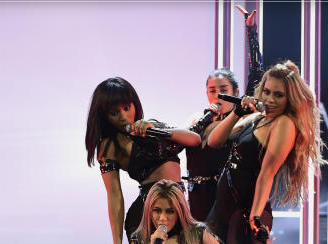 The group -- now consisting of Ally Brooke, Normani Kordei, Dinah Jane and Lauren Jauregui -- took the stage in Los Angeles on Wednesday night to perform “Work From Home” to the celebrity-laden crowd. Immediately after their spirited rendition, the ladies stuck around to accept the award they’d also won that night, for Favorite Group, an honor they’d picked up for the second year in a row. There was no mention of Cabello in their acceptance speech.